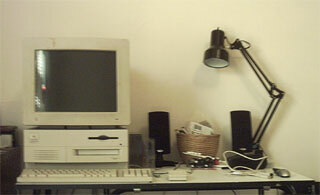 Apple Quadra 650 set up as webserver, circa 2004. The year was 2004. I was given a 10 year old Apple Quadra 650 from one of my sister’s friends. It was dirty. It was heavy. It was slow. I decided that even though this machine was designed before the dawn of the internet, it would be a great idea to make this a little server – because, why not? So I did. With some upgrades (as described above in my table from my old website), this machine did handle a light HTML-based website with ease. Of course, there was little to no load most of the time either. After less than a year of running this machine as a server for HTML, IRC, and FTP, I decided to take it down and purchase some “real” webspace. It was getting expensive (and very warm in my closet) running this 24/7. Since then it has been in storage. It really doesn’t have a good use (for me) anymore, and I have found it a new home, on a shelf on display in a classroom. So this is my last “thank you” to the wonderful “Quad Serve,” the first computer I overclocked, my first server, and my first major overhaul/upgrade – thank you Quadra 650. This entry was posted in Computers and Hardware, Hobbies, Home and Homestead, Personal, Technology, Web/Internet. Bookmark the permalink.